The next caller had advice. Her eight-year-old son was exploding after school until Mom realized that he didn’t know how to decompress. So she put a beanbag chair in a quiet corner with a CD player and a few of his favorite books. I’m sure every listener bought a beanbag chair that day. But that mom reminded everyone that helping our kids manage emotions starts by showing them how. 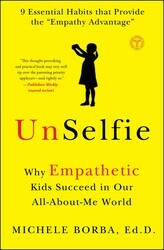 Learn these simple steps and more in my book UnSelfie: Why Empathetic Kids Succeed in Our All-About-Me World. Model calmness. Your child’s best template for learning self-regulation is you. So how do you act in front of your kids after a hard day? When you’re driving with your children and another car cuts in front of you? When the bank says you’re overdrawn? Your kids are watching, so make sure your behavior is what you want them to copy. Develop physical ailments like a headache, stomachache, or heart palpitations? Try to avoid the person or the scene? Become distressed and try to block out the person’s pain? Have trouble bouncing back and need a long time to recover? Need help calming down to recover? 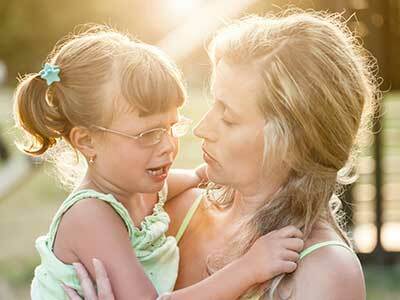 Learn your child’s emotional needs so you can empathize and know how to help. Identify body alarms. Say: “We have little body signs that warn us we’re getting upset and need to calm down.” Help your child recognize her body alarms such as flushed cheeks, clenched fists, tightened muscles, pounding heart, churning tummy, dry mouth, and quicker breaths. Then point out her sign quietly when she first gets frustrated: “Your hands are in fists. Are you feeling yourself getting stressed?” The more kids are aware of early stress, the better they’ll be at regulating their emotions. Create a quiet space. Find a place to help your family decompress. Size doesn’t matter, but it should have a soothing feel. It might have a beanbag or rocking chair, soft pillows, stuffed animals, or a CD player. Introduce it as a “place to calm down for every family member.” Hint: Kids should equate the spot as a place to decompress, not for discipline or time-out. Make a Stress Box. My friends at the Thompson Child and Family Focus developed a Stress Box to teach students self-regulation. It includes an MP3 player with soothing music, a Koosh ball, a bubble blower, and a notepad and pen or crayons to “write away their anger,” and books about feelings. Younger kids: Glad Monster, Sad Monster, by Ed Emberley and Anne Miranda; On Monday When It Rained, by Cheryl Kachenmeister. Older kids and teens: Fighting Invisible Tigers, by Earl Hipp; or Hot Stones & Funny Bones, by Brian Luke Seaward. Make a family stress box, teach everyone how to use each stress reducer, and then put it in your quiet place for your family. Teach a self-regulation strategy. Each child needs a calming strategy that works for him. This chapter offers numerous self-regulation techniques, so find one that appeals to your child.Then help him practice until it becomes a habit.